President Muhammadu Buhari, said Saturday in Lagos that he would not relent on quest to rid Nigeria of corruption if re-elected president in the coming February 2016 election. According to him there will be no pause in jailing looters of the nation’s treasury. 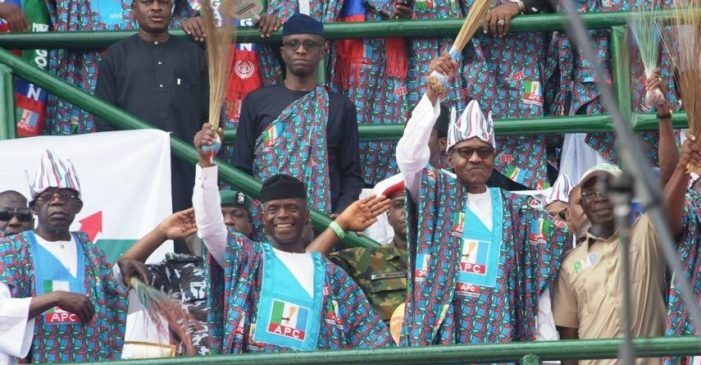 Buhari spoke at the Presidential rally of the All Progressives Congress at the Teslim Balogun stadium in Lagos. He insisted that his administration had delivered on the promises made in 2015 upon which he was elected into office. Many Nigerians however disagree with President’s position, saying that his administration has brought about unprecedented suffering in the land. Buhari, who was in Lagos in continuation of his presidential campaign rally ahead of Saturday’s Presidential election, said if re-elected, he will continue the fight against corruption. He insisted it was his government’s responsibility to send to jail those who had corruptly enriched themselves from the coffers of the country. “I assure you, whoever is entrusted with public property, his primary responsibility is to account for it. If the proper thing is not done, we will eventually get hold of them; take away what they have stolen and get them imprisoned. Earlier in his comments, the National Leader of the APC, Bola Tinubu, said former President Olusegun Obasanjo was the greatest election rigger in Nigeria and should be relegated to the dustbin. According to Tinubu, his comment was based on a reported statement credited to the late President Umaru Yar’Adua, who stated in 2007 that the election which brought him into power was flawed. He also reminded the crowd that during the Obasanjo/Atiku administration major companies moved away from the country, adding that the PDP’s move to return to power was to continue the sale of the country from where the party stopped. National Chairman of the party, Adams Oshiomhole, handing over the party’s flags to the APC governorship candidate in the state, Babajide Sanwo-Olu; his running mate, Obafemi Hamzat; as well as other candidates, said Atiku should not be trusted because he did nothing that had made the masses to remember him after he left office. “If as vice-president he did nothing, why should we trust him? Look at our vice-president, Yemi Osinbajo; he can go to the market places and traders will come out to identify with him. Atiku only has a way of enriching himself and his friends when he is in government.